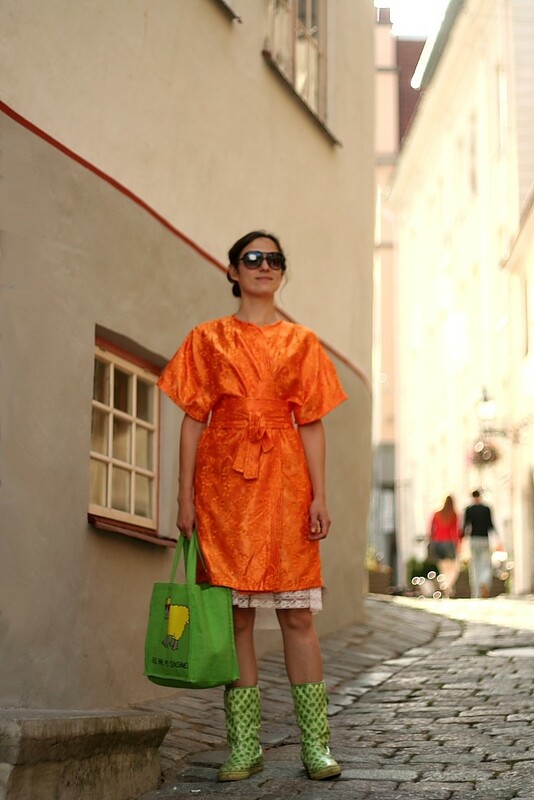 My friends have already gotten used to the fact that I always wear crazy and over-the-top outfits - preferably in green and orange - but when I'm in a bus or walk around the city there are always some older ladies, who look at me as if I have gone mad. I make all, or at least most, of my clothes, so when I go shopping then I mainly shop for cool fabrics. I got the orange fabric for this dress from Norway, but there are really nice fabric shops in Tallinn. Besides all that, I think it is important to have comfortable clothes and accessories, which would work whatever the weather or situation is. Also, I don't care too much about fashion, because it can be a bit restrictive and I just want to wear whatever is me and makes me happy. 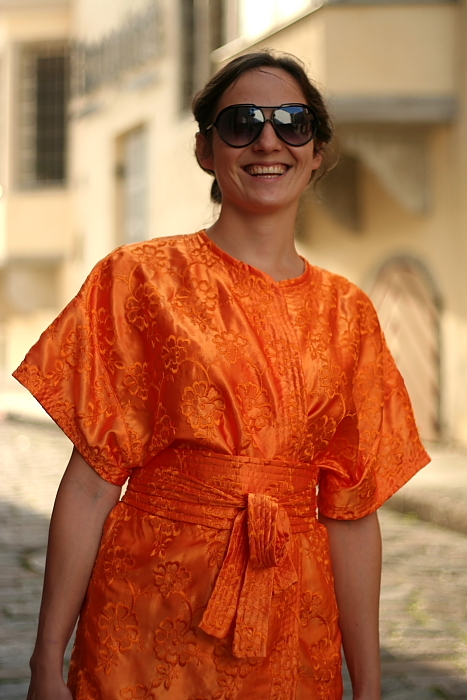 I just got back from a trip to Berlin and Paris and I spent a lot of time in a car, so I thought I want to wear something very comfortable and flowy. The dress I'm wearing today used to belong to my mother. I get a lot of ideas from my trips abroad, because it is just nice to do some people-watching and see what works for other people. Besides that I get inspired by art. Recently my big favourites are Klimt's paintings and the small patterns and motifs in his art. I'm a huge fan of patterns anyway. They make ordinary looks more extraordinary. 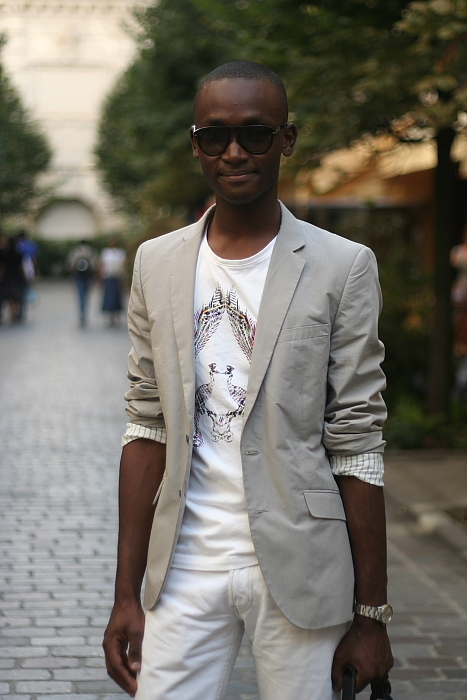 However, art, people-watching and also music don't just affect the way I dress, but inspire me in general. Fashion can't be separated from other aspects of life. Climate in the northern areas sets restraints to what we can or can't wear. It is still summer, but you constantly have to worry about clothes that would be suitable for colder weather as well. Therefore, in summer I try to wear heels as often as possible because in the winter it would be way too risky. Also, just because of the climate, I try to be more tolerant towards people wearing fur. I currently like big prints, the 80s fashion, shiny textures and everything that is over-the-top, but I try not to spend too much time and money on finding suitable clothes. This year's autumn collection at H&M is such an improvement and looks somewhat high fashion. For example, I got this jacket from there as well. In Helsinki, the fashion scene is picking up slowly, but it is still a small and very specific market. It is very clear that people here prefer more minimalist style, which might seem boring in, say, London, but is essential to our fashion scene. I really like the transformation that Kanye West has gone through. Just a couple of years ago he was just a random rapper, but now he is a style icon. Most male celebrities (and men in general) are not brave enough to take any fashion risks. I'm a dancer so I get ideas from music and it also means that my shoes have to be comfortable and, therefore, I'm obsessed with colourful and crazy sneakers. I just got a pair of golden ones, but I haven't worn them yet. I would love to get the sneakers Kanye designed for Louis Vuitton. Also, I want to get these old-school Timberland boots. I buy a lot of my clothes abroad or ask my girlfriend to 're-design' some old ones. For example, with this sweater she just added the strawberry detail and changed the buttons, and now it looks much more fun than just an ordinary black sweater. Today I'm wearing a vintage maxi dress and a woven Balenciaga bag. This kind of mixing of high end with vintage is somewhat representative of my usual personal style. Besides Nicolas Ghesquière and Balenciaga, I also love everything that Albert Elbaz creates for Lanvin and Isabel Marant. For more everyday clothes I like Paul & Joe, which is cheaper, but still is very fashionable and has a great quality. I think Paris is great, but the fashion crowd here kind of looks the same. Simple, chic and mainly black outfits are nice, but I think it is not as inspiring as maybe a couple of years ago. My greatest style inspirations are my parents. My mum is a designer so I can always go up to her if I need some new ideas. Paris is a metling pot of all the cultures of the world. Maority of people here are not from Paris, so it is difficult to talk about Parisian style, because very often it is just foreigners imitating what they think is the Parisian style. But I guess people here, especially, in certain regions, are keen consumers of high fashion. Designer clothes can be amazing, but only when you make them your own and carry them off. I don't like when outfits are copied straight off the runway or a magazine. Personal style should be a mixture of diffeent classical basics, trendy pieces and high fashion: Zara combined with Chloé and Dries Van Noten. This summer I have been wearing different Indian trousers pulled up and worn with several belts. The important thing is to feel confident and empowered in your clothes. This is the only way how to survive, especially, in a fashion world. Everyone wants to bring you down, but they actually can't if you don't let them. It is pointless to think what others think, because, honestly, your taste and what suits you is not going to change based on someone else's opinion. Also, I think people, who are comfortable with what they wear, look more beautiful. My personal style is somewhat colour-oriented, but I usually like to add some unexpected splashes of colour like, maybe, a bit bright yellow or purple. My favourites are Balenciaga and YSL, because they not only have innovative designs, but their clothes fit perfectly as well. This fall I want a beige woolen coat, and a pair of pinstriped trousers. My style icons are Grace Jones and Jude Law. S. J. : I'm from Australia, but I live in Paris now. I don't think you can really compare fashion here and there, because the quality of clothes and the amazing designs of French fashion houses are legendary. My favourite label here is Maje, which creates one of the most amazing yet wearable clothes out there. However, I also like more affordable brands like See by Chloé and Marc by Marc Jacobs. I'm a keen reader of all these different fashion magazines, but French Vogue and L'Officiel are the cream of the crop. However, it is not all about French style and my all-time favourite style icon is Sarah Jessica Parker. 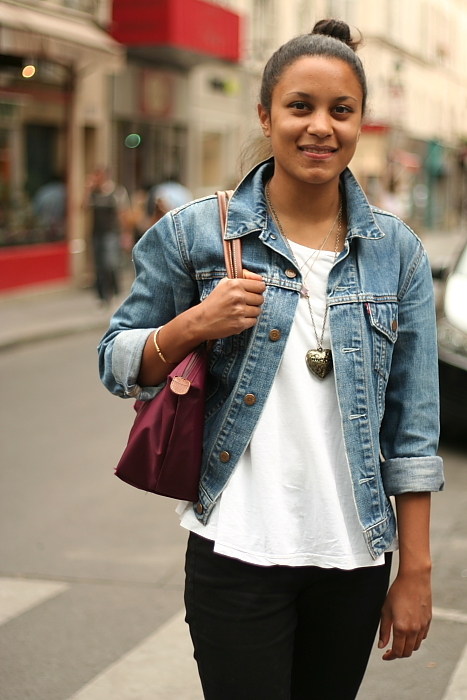 J. : My favourite places to shop are charity and other op shops, and different flea markets. I don't care too much about brands, but I do like Levi's for jeans. Also, sometimes I just like to borrow Stephanie's clothes that have a more androgynous look. I like retro rock style. 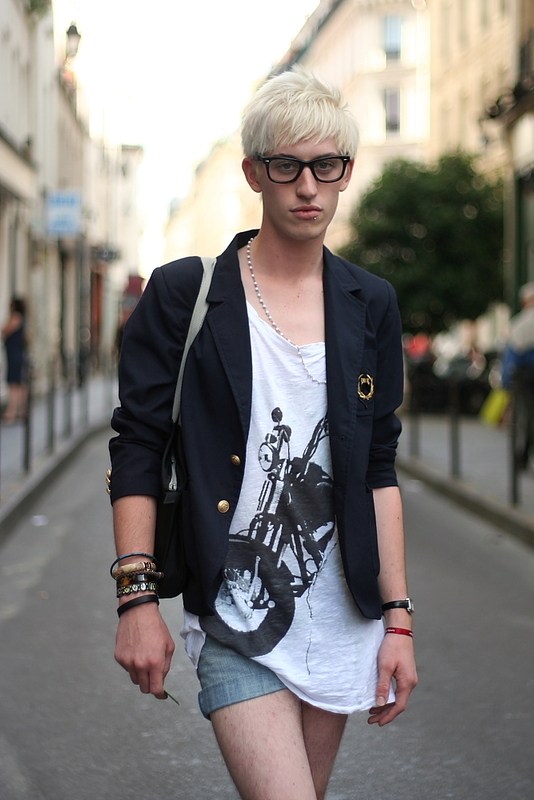 I like when people mix the simple and chic French style with more eclectic and over-the-top British style. It creates this nice balance between these two style that are bit too severe just on their own. I'm currently very into British fashion, because I recently discovered the amazing style of Alexa Chung and also Topshop. From French labels I like Sandro, but their new fall collection is bit too dark for my taste. 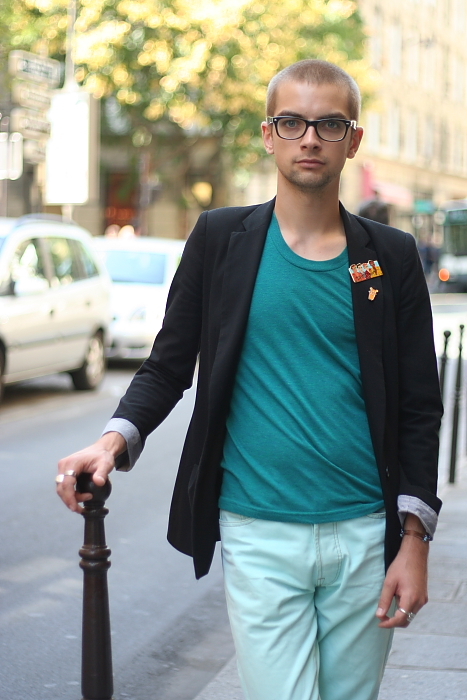 I find it so boring and uninspiring that Parisian fall style is black and high heels. I want something new. My personal style is quite simple. Currently I like these black cigarette pants and I love oversized t-shirts. I get most of my shirts from men's department, because they have a nicer fit. I just got some from Marc by Marc Jacobs. I'm also very into different jackets and unique necklaces. Although I like most accessories, I'm not a big shoe-person. I just tend to wear the pair I love the most, which at the moment is this one. This hairstyle and these glasses combined are already a strong fashion statement on their own and at the moment kind of the most important aspect of my personal style. This is why I don't want to go too overboard with other current trends and I prefer vintage clothes. Also, it is less likely you will run into someone looking the same. Besides vintage, I also like Noir Kennedy. 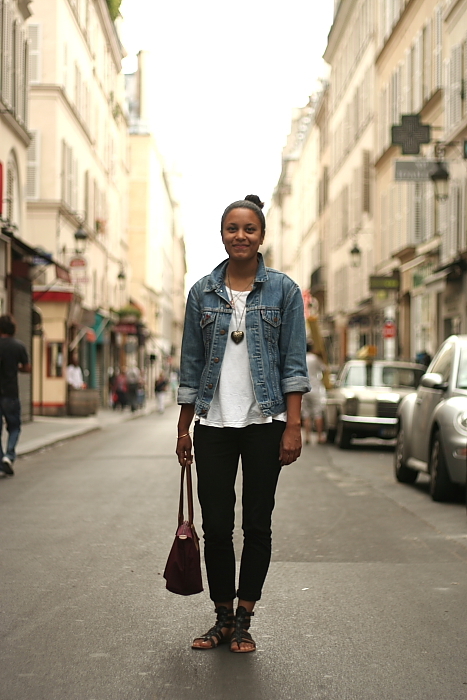 In Paris every region, or the quarter, has their own character and locals with their style reflect that. So, it would be already inspiring enough to just walk around in different parts of the city, but for a more surreal high fashion experience, I like to every now and then flip through Citizen K and French Vogue. I’m in love with everything Karl Lagerfeld does – he is so creative and such an inspiration. 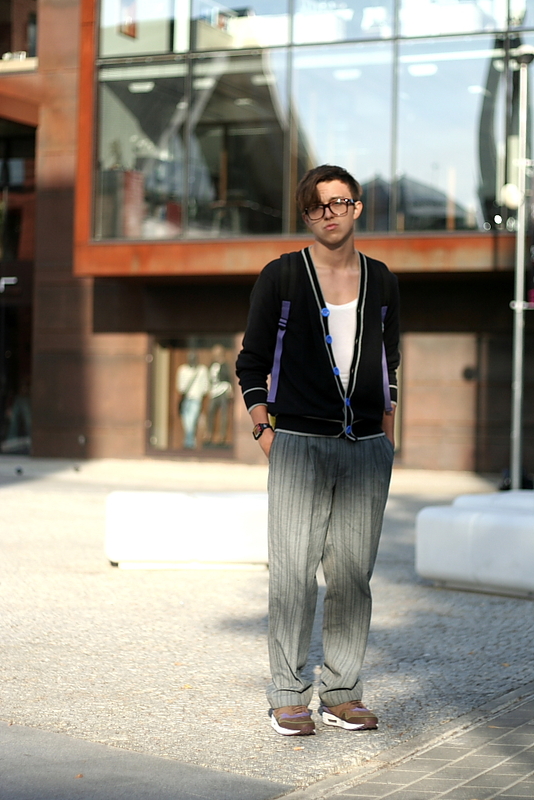 He is not only one of the most amazing designers, but his personal style is great as well. I like how in his designs he plays with androgynous style and makes it very feminine, for example, if you look at typical Chanel clothes. I’m personally also very into masculine clothes, but I think the more feminine you are, the better you can balance them. At the moment my favourite item is this blazer, which I got from Zara. Zara is my favourite shop for all the basics. I’m also wearing my boyfriend’s shirt, boots from Stockholm and a scarf I got from Universaal Universum.